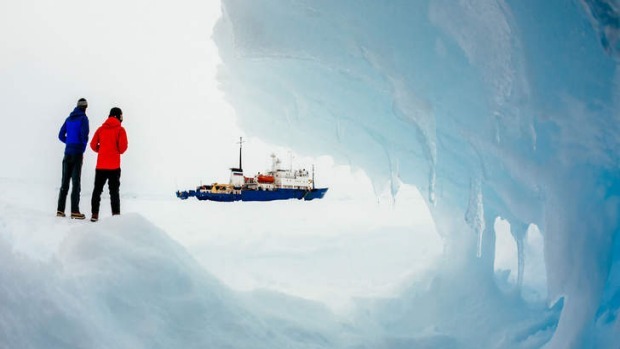 The Aurora Australis has abandoned its first attempt to cut through the ice surrounding the stranded Akademik Shokalskiy in Antarctica after moving just two nautical miles. About 6am, the Aurora's captain, Murray Doyle, began to manoeuvre the ice-breaker through thick wedges of consolidated sea ice. But by 9am (midday Sydney time), the master made the call to turn the ship around and move back into open water. "The ice became too thick for us to penetrate. Some of the floes are up to two metres of ice with a metre of snow on top and very compact. "There was just nowhere for us to go." Captain Doyle also feared that the 55-kilometre south-easterly wind running up the ship's stern would blow ice in and around the back of the vessel. "It was pushing those same types of floes in behind us," he said. "If we got into that compact stuff it would have sealed us in, we would have lost our manoeuvreability and we wouldn't have been much use to anybody. "Having been caught in ice before, I know by experience when to get out. I didn't want to add to the drama, instead of being part of the solution," he said. A low-hanging fog also hampered rescue efforts. "We had no visibility so we couldn't really see if there was a way through." Captain Doyle had informed the Rescue Co-ordination Centre in Canberra of the situation. The passengers on the stranded Shokalskiy would most likely be evacuated to the Aurora or Chinese ice-breaker the Xue Long, which was also in the area. "It's now up to us three ships [the Shokalskiy, the Aurora and the Xue Long] to agree on a [rescue] strategy," Captain Doyle said. While the Xue Long had a helicopter on board, it was too heavy for the Aurora's helideck. "We also can't use the helicopter at the moment because there is no visibility," he said. "The helicopter wouldn't be able to differentiate the horizon from the ice." Captain Doyle had informed Shiokalskiy by email and radio of the situation. "They're OK at the moment, they've got no problems," he said. The captain planned to wait until the weather cleared before deciding whether to cut another path through the ice. 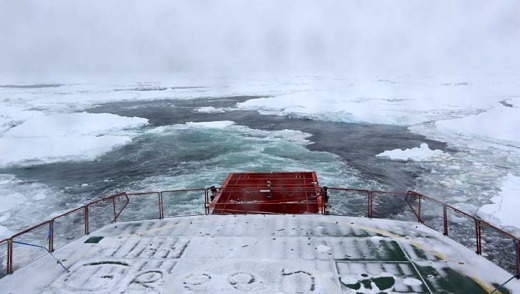 The ice-breaker was designed to cut through ice floes of about 1.35 metres, not the thick ice built up in Watt Bay, some of which has grown over several years. "It wasn't all multi-year ice, there was some first-year ice, which can be thick, especially if it's old first-year ice," he said. The Xue Long, which has been waiting near the Mertz Glacier since Boxing Day, was also making its way back to open water. "They're trying to make it back into open water so they're not trapped as well," Captain Doyle said. Nicky Phillips and Colin Cosier are travelling on board the Aurora Australis as part of the Australian Antarctic Division's media program.